We commented on a research article evaluating blood mercury levels in adults eating seafood. the 2010 Dietary Guidelines for Americans advise Americans to consume 8 ounces (227 g) of seafood per week to reach an average intake of 250 mg/d of the omega-3 fatty acids EPA and DHA. This recommendation represents a substantial increase over current consumption amounts of ∼3.5 oz/wk. It is based on “moderate, consistent evidence” that the health benefits of increased seafood consumption outweigh the risks associated with methylmercury, a toxic contaminant of large predatory food fish (tilefish, shark, swordfish, king mackerel) and, to a lesser extent, albacore (white) tuna. To avoid this toxin, the guidelines advise eating seafood typically found to be low in methylmercury, such as salmon, anchovies, sardines, and trout. Such advice, however, leads to at least 3 dilemmas. Eating more fish might raise methylmercury intake above safe amounts. Pressures to consume more fish might place impossible demands on an already threatened seafood supply. And the obvious solution—fish farming—raises concerns about what farmed fish are fed and how farmed fish affects the environment. Wise seafood choices may be an oxymoron, alas. Oh great. All U.S. fish are contaminated with mercury. 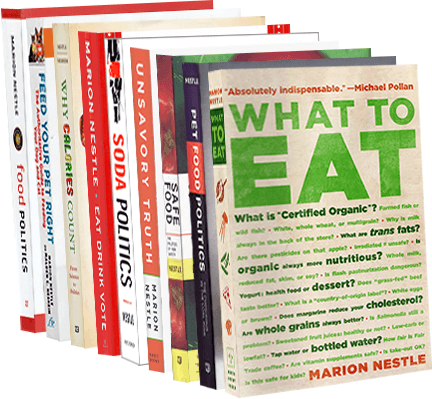 My book, What to Eat, has a chapter on the mercury-in-fish dilemma. Do we follow dietary guidelines to eat more fish or do we worry about the amount of toxic methylmercury those fish might have? The U.S. Geological Survey and Department of the Interior have just released a report that will not make this dilemma easier to resolve. Fish in every one of 291 streams sampled throughout the country are contaminated with mercury. According to the press release, the good (well, slightly better) news is that “only” a quarter of the samples exceeded federal guidelines for people eating average amounts of fish. The remedy seems pretty obvious: let’s insist that coal-burning power plants and mining operations clean up their emissions. How about right now! Never a dull moment. The Institute for Agriculture and Trade Policy (IATP), a think-tank in Minneapolis, tested brand-name foods made with high fructose corn syrup (HFCS) and found about half of them to contain mercury. HFCS, it seems, is made by a process that involves lye, which in turn is made in chlorine – alkali plants by a method that uses mercury. Mercury is a neurotoxin, although not as bad a toxin as methymercury, the kind that accumulates in large, predatory fish. A scientific report published in Environmental Health says the amounts of mercury in HFCS ranged from 0.00 to 0.57 micrograms per gram. The IATP’s bottom line: the process for making HFCS should be changed to one that does not introduce mercury. This seems like quite sensible advice, but how worried should we be about mercury in HFCS? I agree that mercury in any form is unlikely to be good, but I have no idea whether such low levels do measurable harm. For one thing, these studies did not compare the amounts of mercury found in HFCS to those typically found in foods that do not contain HFCS. My guess is that most foods contain low levels of mercury because mercury is prevalent in air, water, and soil, especially around coal-burning power plants. Also, soft drinks are the major sources of HFCS in American diets, but these were found to be relatively free of mercury. This is puzzling. If anything, these studies are a call for more research on heavy metal toxicology. In the meantime, let’s lobby for changing this process for making HFCS, but even more so for cleaning up coal-burning power plants that supply 40% of mercury in our environment. Update January 28: Food Production Daily has a good report on this, with quotes from the Corn Refiners.